Experience a truly distinctive Las Vegas wedding, event, and meeting destination, recognized with some of the industry’s most prestigious awards and accolades. 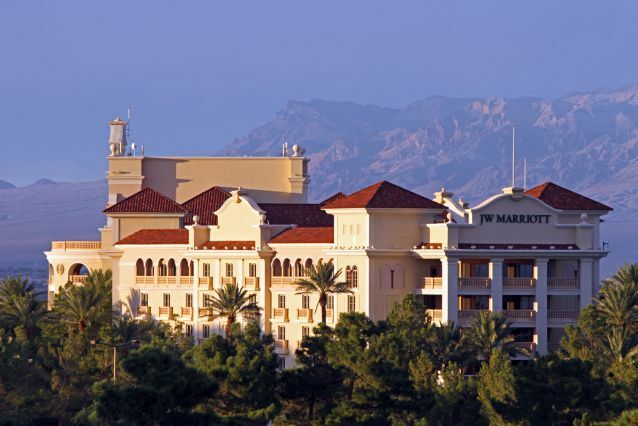 At the JW Marriott Las Vegas, our gracious sales and event staff have been recognized for their excellence in seamless execution of meetings and events at our resort. Our redesigned meeting rooms feature state-of-the-art audiovisual technology and Wi-Fi access. We offer over 100,000 square feet of updated indoor and outdoor venues, ideal for weddings and meetings of all sizes. Explore our creative venues, with 43 event rooms including the stunning Cascade Ballroom for intimate events of 20 guests to grand affairs of up to 800 guests. Dream weddings don’t just happen, they’re planned. Our experienced Wedding Planners are trained and qualified to coordinate weddings of all types, including ethnic, LGBT and military weddings. Wedding guests will enjoy our serene Las Vegas location, not far from the airport, Summerlin and The Strip. Nested in the foothills of the beautiful Springs Mountain Range, our resort is surrounded by 54 acres of lush grounds, including spectacular koi ponds, waterfalls and winding trails through meticulously manicured grounds that provide the perfect setting for memorable events.